US, 1940, 69 minutes, Black and white. 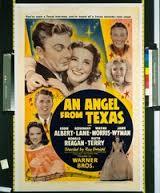 Eddie Albert, Rosemary Lane, Wayne Morris, Jane Wyman, Ronald Reagan, Ruth Terry, John Litel. An Angel From Texas is based on a play by George S. Kaufman (The Man Who Came To Dinner) and portrayed in act one by George Hamilton. Co-writer is Fred Niblo Jr, prolific writer at Warner Bros from 1930 to 1950, son of Fred Niblo who made the original silent Ben Hur. The film focuses on Rosemary Lane as a young woman in a small town who goes to New York to be an actress, farewelled by all the town. She leaves behind her beau, Eddie Albert, living with his mother and pining for her. Eventually he goes to New York and finds she has had no success. However, she is employed by two conmen who are putting plays on Broadway with a blonde actress, Ruth Terry, backed by gangsters. When they hear that Eddie Albert has money to spend on hotels, they realise that they can pay their debts by getting him to invest, he being very cautious. Ultimately, for his girlfriend, he decides to invest, there are ups and downs of fortune, all kinds of con meetings, threats by the gangsters as well as the original actress. However, there are further complications. The two conmen, Wayne Morris and Ronald Reagan (the latter bright in the role, and married on-screen to his wife Jane Wyman), have some tangles and Jane Wyman, teaming with the couple from the country, are able to sell off the company and its success to the two gangsters who immediately are being sued by someone for breach of copyright. It all takes place in sixty-nine minutes, fast-talking, fast-paced, amusing but slight.